In Japan, taxis are typically black. Sometimes, they're white or even yellow, but generally, people think of them as being dark-colored and dull looking. These taxis, however, are anything but. You are looking at "itataku" (痛タク). "Ita" (痛) literally refers to "pain", but it's now slang for things covered with geeky stickers, whether that's cars, snowboards, or bicycles—whatever. The word "pain" refers either to the pain they inflicted on their owners' wallets or the pain unleashed on everyone's eyes. Here, "taku" is short for "takushii" (タクシー) or "taxi". The northern Japanese city of Sapporo in Hokkaido is becoming famous for its itataku. 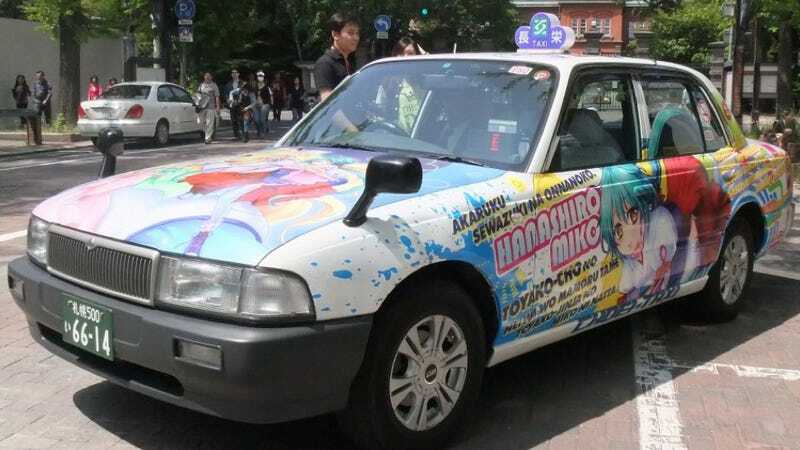 As Japanese site IT Media explains, the trend really began to take off last summer when a taxi was "sticker wrapped" with Little Berries, an iOS sightseeing app for Hokkaido. Last summer's itataku wasn't the first, however. There have been itataku spotted in other parts of Japan during the past few years, such as below. It's not uncommon for trains or monorails in Japan to be wrapped with soft drink or restaurant ads. There have even been sticker wrappings for buses. But "itataku" seemed new and created a great deal of media interest. Since then, other geeked out cabs followed, ranging from Evangelion to Resident Evil 6. While these taxis might promote games, anime or even pop stars like Eir Aoi (below), the cab companies are supposedly not receiving advertising fees, due to strict regulations on how ads can be displayed on taxis. Instead, the cab drivers and cab companies shell out the equivalent of several hundred dollars to cover their cars in the things they love. "To be honest, this is for the taxi drivers," Norihito Takeuchi of Sapporo cab company Choei-Taxi tells IT Media. The idea is also that these colorful cabs are eye-catching and liven up the city streets—and, thus, Sapporo. The itataku seem to be worth the excess cash: Geeked out taxis are apparently doing twice as well as regular ones, Takeuchi says. That means the drivers are, too. As Takeuchi explains, regular advertisement fees go to the taxi companies. The drivers don't see a yen of them. However, itataku, even with the free publicity, directly impact the driver. They stand out in a sea of bland taxis, and some folks really want to take them, because they are so unusual. Prior to Choei-Taxi's Little Berries taxi launch, Takeuchi decided to wrap a taxi for last year's Toyako Manga-Anime Festa. While he hired someone to wrap the car, Takeuchi oversaw the design himself. The nerd covered taxi was a big hit—which must have been satisfying for him. Previously, he had pitched the idea of wrapping cabs—an idea that had gone nowhere. It's now a win-win situation. Video games, anime, and pop music can get free publicity, while Choei-Taxi drivers can attract passengers. In the meantime, Hokkaido is expanding its own geek subculture. "I think it would be great if Hokkaido became famous for itataku," said Takeuchi, adding he hopes that visitors from foreign countries come to Hokkaido to see the itataku. "I want various kinds of itataku on the streets." By the looks of it, these nerd chauffeurs are on their way. Taxi!